At age ten, Diane began painting under the guidance of locally prominent landscape artists in New Orleans and Baton Rouge. She soon developed an interest in scientific illustration and later received a full scholarship to attend Tulane University, where she studied biological illustration, art history, and the natural sciences. After receiving her degree in 1982, Diane moved to Florida's west coast to begin her career as a professional illustrator. Because of her lifelong love of fishing, she decided at this point to specialize in fish illustration, using pen-and-ink and dry-brush watercolor. By 1986, Diane had begun painting in oils again, allowing her to balance the hard regimen of scientific illustration with the freedom of oil painting. In the past few years she has expanded her subjects to include landscapes once again. Diane's artwork has appeared on the covers of sport-fishing periodicals and on numerous marine conservation stamps/prints and educational publications produced by several state governments. While her work continues to grow in popularity among private collectors, Diane still maintains an active illustration career, with her first priorities going to projects that enhance conservation of our natural resources. She is a member of the international Guild of Natural Science Illustrators and an honorary lifetime member of the Florida Chapter of the American Fisheries Society. In 1998, Diane began serving on the Board of Directors of Fish Florida!, a nonprofit organization helps people, especially children, learn about fishing and Florida's environment. 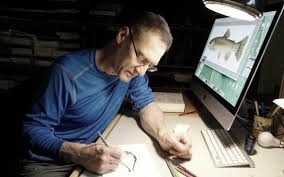 Joseph R. Tomelleri has been illustrating fishes since 1985. Joe works in Prismacolor pencil, and his 1,100+ illustrations have been rendered from actual fish to ensure scientific accuracy. He has collected the majority of his specimens in the field so he can study and photograph the fishes and preserve them for use in the illustrations. Joe's work has appeared in more than 1000 publications, including Trout and Salmon of North America, Fishes of Alabama, Outdoor Life, The In-Fisherman, and Eddie Bauer. His recent projects include research on the native Trout of Mexico, Fishes of the Salish Sea and Puget Sound, Fishes of Texas, and Fishes of Kansas. Joe lives in Leawood, Kansas with his wife Susan and their two sons. 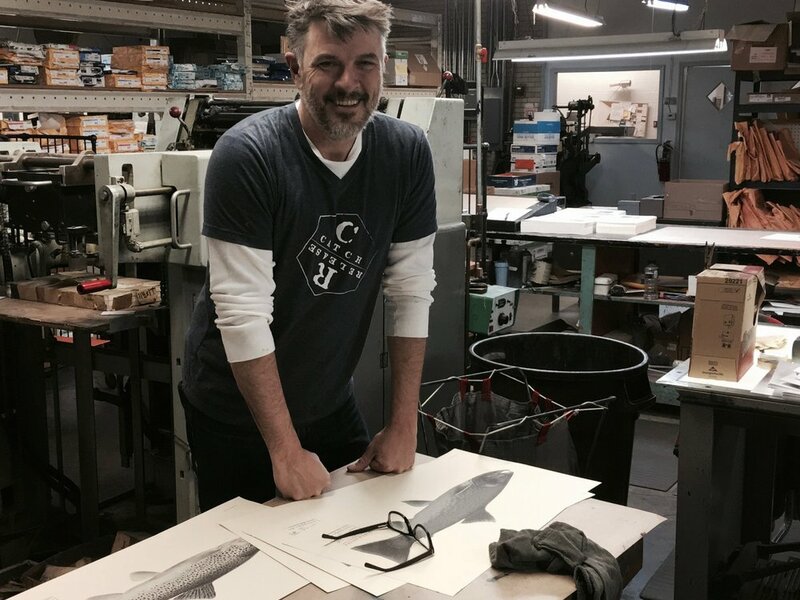 The idea behind The Fish Print Shop began with Mike. Mike is a fishing enthusiast with a background in Biology. After many trips introducing his 3 boys (and their friends) to fishing, Mike thought there should be a better way to give people a memento of a day on the water- while still preserving fisheries. To Mike, the pictures just don't do justice to size and grandeur of the specimen. Also, it seemed the fish photos never leave the camera or cell phone. "People always want to show you with their hands how 'big it was'", Mike explains. "That's because seeing it life-size is so much more rewarding than the photo". Mike enjoys fishing and spending time with his wife, Lisa, and their three sons.